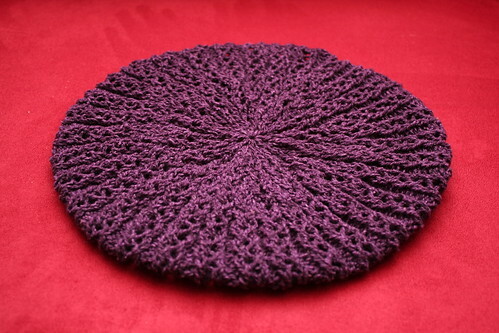 I realized about a week ago that I still have one FO from 2009 that I never properly photographed or blogged! Whoops. I thought Liesl was the last FO of 2009 that I hadn’t blogged, but I guess I thought I’d blogged about it and never actually did. Notes: I had a little less yardage then the pattern requirements, so I decided ahead of time that I’d just do however many feather and fan repeats I could before binding off. I ended up being able to work a total of 8 feather and fan repeats before doing the bind off. I think I could have done a 9th repeat, but decided against it because I didn’t want to run out of yarn. I absolutely love this yarn! It feels so soft to work with. 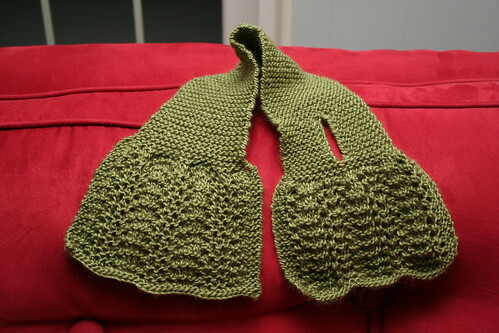 Pattern was easy enough to modify to less repeats (or more if you wanted) and was a pretty quick knit. There’s also another FO for 2009 I didn’t post because of the swap I did and now that package is lost in the mail. I won’t be re-knitting the same pattern or using the same yarn, but I’m undecided on if I should go ahead and post about it now (while I’m working on a replacement package and item) or wait. Thoughts anyone? Since the beginning of the year, I’ve finished three projects. The shawl for my grandma has a LOT of notes. I had a fair amount of trouble with it, plus changes and other thoughts. I’ve been putting off writing about it because it seems like a huge task and definitely needs it’s own blog post. So, while you wait for that post to come, I’ll share the other two projects I’ve finished this month. 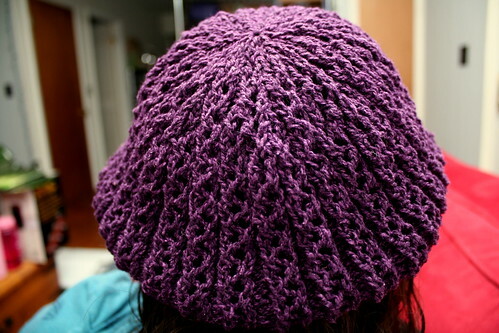 Notes: This was a pretty easy knit until the decreases. You really had to pay attention because you have to move the marker a lot at the end. 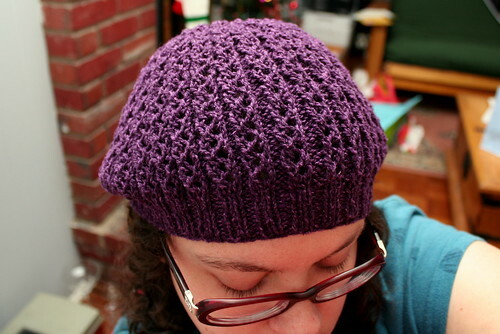 I like how it turned out and the pattern was a fairly quick knit. 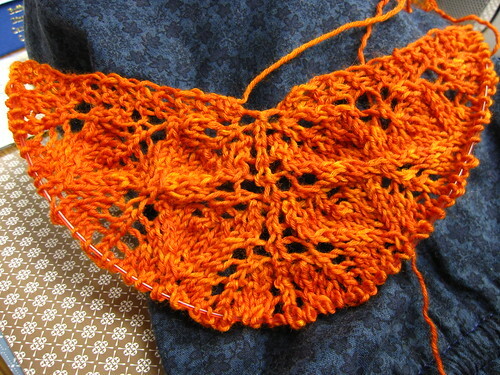 I think it would have been done a lot sooner, but I had to put it down to work on my grandma’s shawl. 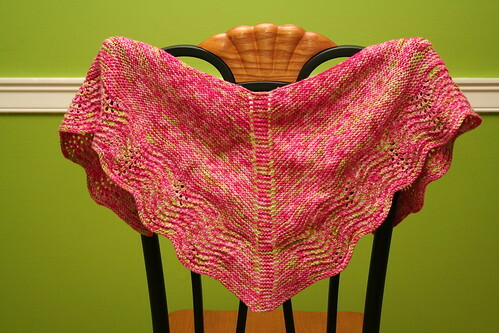 I love this yarn and the pattern. 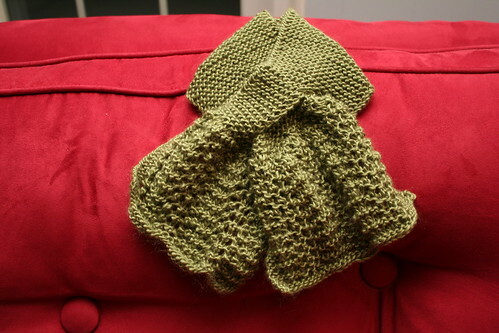 After I finished Porom, I started this little scarf and finished it with a quickness! I’ve been working on Matt’s socks, but not without a lot of bumps along the way! First sock I knit was too big. It was just a little too long and the ribbing around the ankle was far too loose. 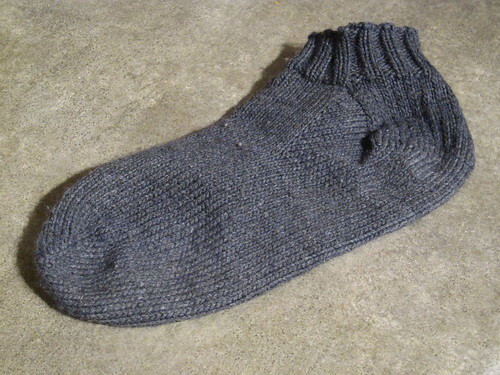 The first one was knit toe-up with a slip stitch heel. I should have just gone with a short-row heel, but I thought this might fit better. Turns out I’m not so great at estimating when to start it! Plus, I think the gauge overall was a bit too loose. So, back to the drawing board I went. 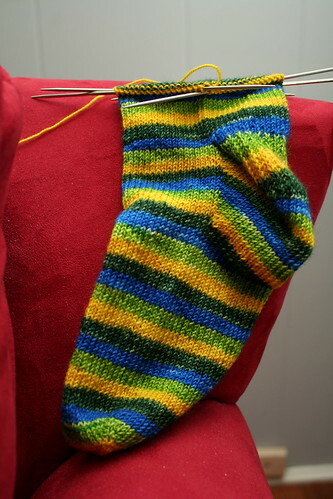 Started a new sock, cuff-down this time, on smaller needles, with more ribbing around the ankle and a short-row heel. I finished that one up last night, but don’t have pictures yet. 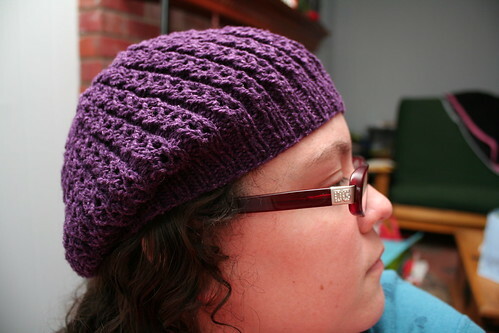 It does fit a lot better, but I think it needs more ribbing. When I asked Matt for feedback on it, he said he did like it more and it fit better overall, but he did say that he liked the toe better on the toe-up sock (which you just can’t replicate top down) and it needed more ribbing on the ankle. I think part of the problem is the yarn. I’m using Berroco Comfort DK, which is a nice yarn, but really isn’t great for socks. It’s a 50/50 acrylic/nylon blend, so it doesn’t stretch well. It makes the foot fine, but the ribbing just doesn’t stay tight. For now, Matt will just have to live with one sock that’s a little too big and one that fits well, but doesn’t have enough ribbing while I make another pair out of wool! 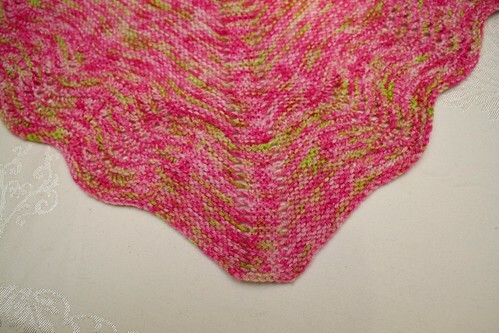 After I finished the first sock, I took a break and cast on Haruni with Wollmeise 80/20 in Campari Piccolo. So far I like how it’s turning out and can’t wait to get to the edging, which is probably my favorite part of the pattern. I just love how the edging looks! At the end of December, I realized that I didn’t have any socks on the needles, so I cast on a toe-up sock (with a slip stitch heel – changing it up!) with a Vesper sock club colorway, Summer Breeze. I’m loving this colorway. It seems so cheery since it’s been rather dreary out lately. Lovely projects. 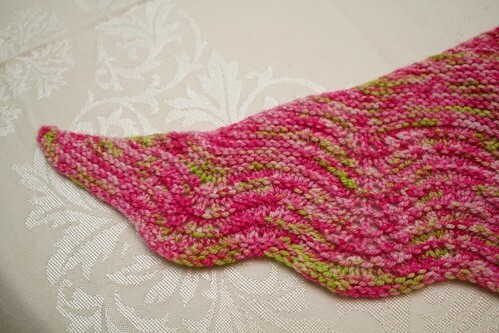 I adore the summer breeze sock. Those colors are such a bright combination! I’d love to hear how you wear your shawls. You make so many and they are gorgeous. I’d love to make one, but I’m afraid it would sit on a shelf. Also, do you wear your socks just around the house, or every day? What kind of shoes do you have to show them off? Your latest projects look great–but so does the photography! I especially like the colors you pick for backgrounds. 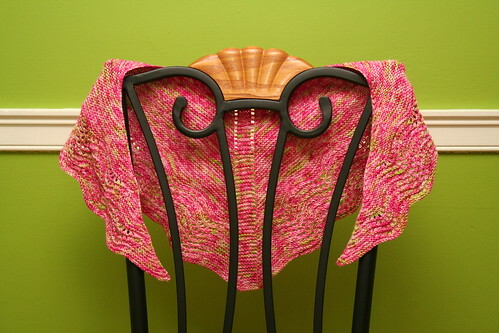 And that unique chair really shows of the special qualities of the shawl pattern! Inspiring! It looks like you painted your wall just so you could have an amazing photo of your shawl! 🙂 Great looking work!